Change is coming to Boulder City. Since growing out of the desert as a company town for Hoover Dam workers beginning in 1931, the city has developed a rather distinct and separate culture that aligns with its physical proximity, nestled into the mountains retaining Lake Mead, only 26 miles and a world away from Las Vegas and its suburb cities to the north and east. Boulder City’s top employers are the federal, county and local governments. Private businesses in the city of 15,000 rely largely on visitors from Las Vegas and Henderson, tourism to Lake Mead and the Hoover Dam and travelers through the busy U.S. Highway 93 corridor connecting Las Vegas to Arizona. The highway leads to the edge of the historic downtown core before splitting into Great Basin Way and veering north along Lake Mead. Many businesses line this entry section of the highway — the business corridor — including Western and Native American craft stores, automotive and marine shops and fast-food chain restaurants, and many of them rely heavily on a customer base of interstate travelers. But Boulder City will soon be cut off from this stream of visitors and the revenue they bring. 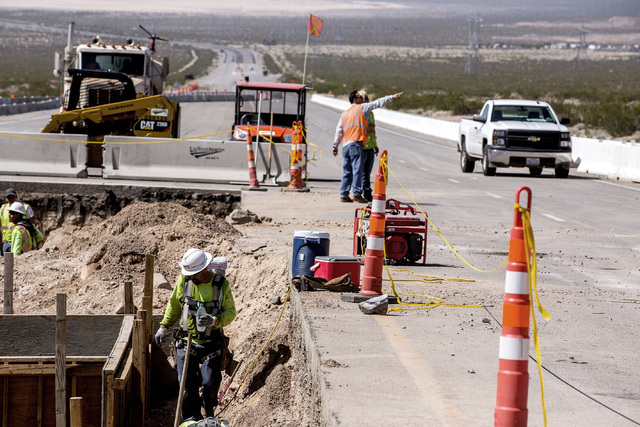 Phase one of the Nevada Department of Transportation’s Interstate 11 project — consisting of a 2½-mile, four-lane concrete freeway between Foothills Drive and Silverline Road — is on pace to be completed within a year. It will cost an estimated $83 million — a combination of federal grants (83 percent of the total), state and Regional Transportation Commission funds. Phase two will complete the bypass around Boulder City, joining the U.S. 93 route just west of Hoover Dam with a 15-mile, four-lane asphalt interstate. The effect of the bypass on Boulder City business owners depends largely on the business in question. Operators inside the downtown core — including restaurants, pubs, inns, art galleries and antique stores — could be insulated from the loss of highway traffic as they tend to rely on a mix of local customers and people who are attracted to the area as a destination for shopping and entertainment. This area may stand to benefit from reduced road congestion, according to Jill Lagan, president of the Boulder City Chamber of Commerce, which functions to assist the city’s economic development efforts. The city also hopes to take advantage of a new truss bridge to extend the existing railroad into downtown Henderson and possibly to Fiesta Henderson on Lake Mead Parkway. The city is vying for state funding to relocate the train depot — part of the Nevada State Railroad Museum — from its current location on Yucca Street south to the street’s intersection with Nevada Highway. Businesses that rely on impulse stops by interstate travelers — principally located in the business corridor — may face existential challenges. “It’s not all rosy glasses. We are very concerned about businesses,” Lagan said. Sectors that are most vulnerable include gas stations, fast-food restaurants and travel service centers. She said the chamber is working with the city to create a beautification project, much like the aesthetic improvements made to the downtown core in 2010, in a bid to extend the city’s ‘destination tourism’ borders. She stressed that, no matter the efforts of the city or chamber, it is imperative for business owners to become adaptive if they are to keep operating. Railroad Pass in Henderson sits at the edge of the Boulder City border. Owner Joe DeSimone factored the project into his group’s decision to purchase the property from MGM in 2015. Railroad Pass plans to take full advantage of the construction by building a travel center to attract truck drivers and other motorists. The 8,000-square-foot center will feature a Capriotti’s sandwich shop, six to eight shower facilities, a quick-service restaurant and a Chevron gas station with eight diesel pumps for trucks and 20 gasoline pumps for cars and recreational vehicles. DeSimone said construction on the facility will likely begin in April or May, when the access road is relinquished by NDOT. He said the property is well-positioned to serve as a hub for trucks traveling between Phoenix and destinations north and west of the city. He said the hotel-casino has experienced minimal negative impact from the construction to date. “We’ve had challenges as it relates to mobilization and how people get to the property through the construction, but we are confident the same experience people have now will be what they will have during construction.